The Universe is a Machine. Your Hand is On The Lever. You’ve been trained to sense the movements of vast, invisible gears, and to wield the tools of making and dismantling. Your garments are smudged with oil and singed with fire; goggles protect your eyes from flying sparks and the sweat that pours from your brow as you labor in your workshop. 45 new and updated spells, including chains of the goddess, gear barrage, hellforging, robe of shards, and more! The magic of the gears is yours to control! Will you use it to uphold order, progress, and industry? Or grind your enemies under the ceaseless cogs of might…? I love clockwork/steampunk, and always slip in little bits and pieces of it in my games (proto-guns, primitive warforged, etc.) So this is right up my alley. From a fluff and fun standpoint, I love the feel of this. You might want to wait for another review if you want thoughts on the detailed balance or combat usefulness, but if you like steampunk, it’s definitely worth $3 to take a look. First warning English is not my first language. From a fluff standpoint a great supplement full of great ideas. Sadly from a gamer standpoint this is not usable as is. The document contains errors in the spell lists and description. Spells are of different levels depending on the description or the magic user spell list. In the current form this supplement need a rewrite to be usable. How odd, the editor fixed those issues in the v3 version of the file some months ago. Are you looking at an older version of the PDF? Hm, redid the July 1 upload here, just in case. The concept of ‘clockwork magic’ first arose in Zobeck and then in the Midgard Campaign Setting, both published by Kobold Press, but of course the almost-magical qualities of clockwork go back to very early times – China about 2500 BC or the Greek ‘Antikythera mechanism’ that is nearly as old. Often used in temples to impress worshippers with their deity’s power, or for navigation and timekeeping, it’s still a bit mysterious if you don’t know how it works. And of course, in a fantasy game we can add magic in as well. It’s a plausible mix of magic and technology for the sort of cod-mediaeval worlds most of us use for our campaign settings… many of which have lost ancient empires to loot for inventions that have been lost as well. Clockwork magic, then, has its origins in time manipulation, precision craftwork and machining, constructs and mechanical devices. Opinion is divided as to whether it was a devotee of a god with a suitable sphere (craft or time perhaps) or a tinkering mechanic who added magic to the steam or water power he was used to using to power his machines that first hit upon the concept. You may wish to establish your own origins for it, or just assume that it is known in certain circles in your world. For clerics, and others of a religious persuasion, there are details of a Clockwork Domain and a couple of sample deities for whom it could be appropriate. Warlocks may seek out the Great Machine as a patron, and gain suitable abilities and access to spells from that connection. Wizards may choose to become clockwork mages, studying the school of clockwork magic. Each of these provides a framework for the individual character to begin to practice clockwork magic in some manner. The rest of the book is filled with an array of spells that are in some way associated with clockwork or time in general, often with links into the fascinating world of constructs. There are other snippets scattered throughout: clockwork creatures you can summon and a nasty disease called rust that affects both flesh and bones and constructed beings. Overall, it’s an entertaining collection of magic. It could possibly have done with some items and gadgets to go along with the spells, but apart from that this makes a good starting point for adding a novel form of magic to your game. This installment of the Deep Magic-series of 5e-pdfs clocks in at 19 pages, 1 page front cover, 1 page editorial, almost one page of SRD, 1 page advertisement, leaving us with 14 1/2 pages of content, so let’s take a look! 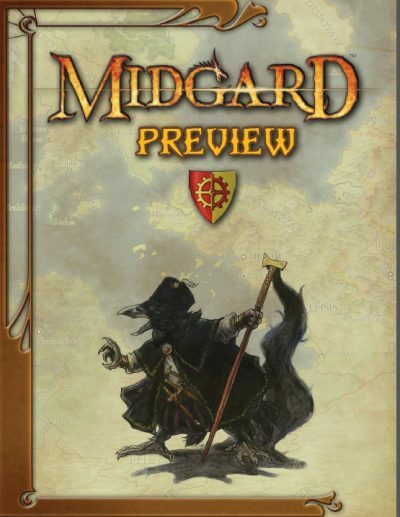 There are few aspects I associate as much with Kobold Press’ phenomenal Midgard-setting as clockwork magic. (In fact, only one: Fey…but I digress..) The magic which spread from the by now legendary city of Zobeck across the disk (Midgard’s flat) is evocative and interesting…so how has it been translated to 5e? Well, beyond two clockwork-associated gods (surprisingly missing Rava!) after a brief introduction to the history of clockwork magic, we dive right into a new cleric domain, the, surprise, clockwork domain. The domain nets proficiency in clockmaker’s tools and heavy armor as well as advantage on attacks versus clockworks and constructs, with the spell-dispersal making sense and good use of the new material herein. Channel divinity lets the cleric hijack constructs if they fail a Wisdom saving throw – if they badly fail their save, the control extends in duration. Starting at 6th level, spells used to repair damage to clockwork creatures etc. always restore maximum possible hit points, which I consider problematic, considering the presence of a clockwork PC-race among the roster for Midgard – a purely gearforged group, for example. 8th level, you can designate a controlled construct within 60 ft. as a viable target for spells that usually only target the cleric. 17th level nets the ability to merge with a construct controlled, restoring all hit points. For the duration, you gain all immunities and qualities of the construct and may cast spells, use class features, etc. This can only be used once per long-rest-interval. I assume that this includes access to the special traits and features of the creature merged with, but I am not 100% sure – the ability could be slightly more precise here. The warlock also receives support here, to be precise, the great machine patron. At 1st level, the warlock may decide to spring ahead in the initiative order to right before a given creature, and yes, this ability is concise and covers the changes in the order properly. This one, much like 6th level’s ability, recovers on a short or long rest. 6th level’s ability lets you reroll a missed attack witha dvantage. 10th level provides immunity to psychic damage and mind reading, unless you allow it and 14th level allows you to designate a creature within 60 ft. The creature must succeed a Charisma save versus spell save DC or take 10d10 psychic damage and must make another Cha-save to avoid being stunned for 1 minute. Once again, short or long rest to recharge. Pact boon-wise, the warlock may choose a clockwork familiar, a changing blade or a pocket-sized device that replaces a book. Three eldritch invocations allow for gear barrage, +1d6 fire damage in melee and reflexive 1d6 fire damage as well as the option to overcome construct immunity to being frightened and charmed. Wizards may opt for the path of the clockwork mage, who gain an aforementioned clockwork familiar. Their school lets them halve time and gold it costs to add a clockwork spell to the spellbook. The duration of animate constructs increases by proficiency bonus minutes, with 20th level providing permanence instead. 6th level nets metal shape, which lets you reshape metal of size Small or smaller under your control. Here’s the amazing: For once, the ability requires familiarity with an object – no easy cheating via key-generation. Cool! 10th level nets golem form, which lets you retain mental faculties, but lets you assume the physical characteristics of a golem/clockwork creature with a CR less than the current level, lasting up to 1 minute per level. 14th level allows for an Int-based hijacking of constructs, analogue to the cleric tricks. The pdf, after several class lists of spells, then begins to introduce new and updated spells: These include absolute command that lets you issue commands to constructs, animating constructs with size by spell slot and base stats for each. Armored heart nets an interesting option to, as a bonus action, gain resistance to the 3 physical damage types for 1 round, enhancing potential defense/withdraw-sections. Taking on a zelekhut’s powers (stats included) – there are some cool tricks here. As a complaint, catapult for example does not specify the damage type it causes (I assume bludgeoning…). This is not the only spell that misses the damage type, though the majority does have them. Rust is added to the list of afflictions available via contagion…all in all, a well-made selection of options. You don’t know what rust does? Well, thankfully, the pdf does cover this! A ritual for hellforged gearforged allows for an interesting variant of the gearforged race. Sacrificing a construct to temporarily imbue a target with construct-tricks…very cool. Speaking of which – have I mentioned the spell that uses a music box to rip open the planes, allowing them to partially overlap? Pendulum is interesting as well, locking d20-throws at 20, 1, 19, 18…which is generally cool, but considering that it’s concentration, up to 1 minute, it kind of loses a bit of its sting and is a better buff than debuff, which is pretty surely not how it was intended, unless it’s supposed to be just one half swing of a pendulum. Interaction with memory gears and winding keys is intriguing. Editing and formatting are very good on a formal level. On a rules-level, some finer details can be nitpicked. Layout adheres to Kobold Press’ beautiful 2-column full-color standard and the pdf sports high-quality artworks. The pdf comes with basic bookmarks for the class features, but not the individual spells. 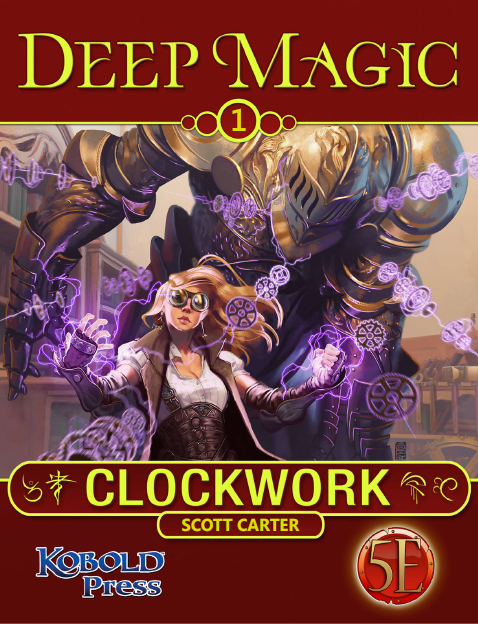 Scott Carter’s translation of clockwork magic to 5e constitutes a well-crafted first installment for the series, though one that misses a couple of minor beats. There are some serious gems here and much of the interaction with e.g. gearforged etc. and the magic aspects that are integral to Midgard have been properly presented. While not perfect, this is a nice, inexpensive pdf and as such receives a final verdict of 4 stars. 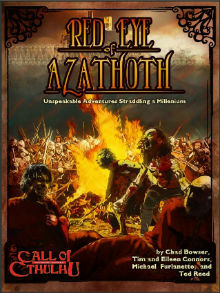 I’m looking forward to the next pdfs in the series! Rust is added to the list of afflictions available via contagion…all in all, a well-made selection of options. You don’t know what rust does? Well, thankfully, the pdf does cover this! A ritual for hellforged gearforged allows for an interesting variant of the gearforged race. Sacrificing a construct to temporarily imbue a target with construct-tricks…very cool. Speaking of which – have I mentioned the spell that uses a music box to rip open the planes, allowing them to partially overlap? Pendulum is interesting as well, locking d20-throws at 20, 1, 19, 18…which is generally cool, but considering that it’s concentration, up to 1 minute, it kind of loses a bit of its sting and is a better buff than debuff, which is pretty surely not how it was intended, unless it’s supposed to be just one half swing of a pendulum. Interaction with memory gears and winding keys is intriguing. Editing and formatting are very good on a formal level and now also on a formal level. 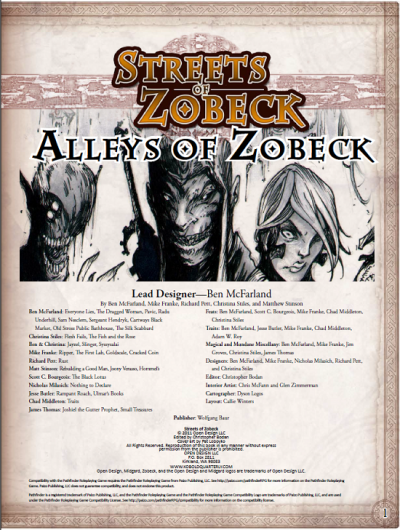 Layout adheres to Kobold Press’ beautiful 2-column full-color standard and the pdf sports high-quality artworks. The pdf comes with basic bookmarks for the class features, but not the individual spells. Scott Carter’s translation of clockwork magic to 5e constitutes a well-crafted first installment for the series, though one that misses a couple of minor beats. There are some serious gems here and much of the interaction with e.g. gearforged etc. and the magic aspects that are integral to Midgard have been properly presented. While not perfect, this is a nice, inexpensive pdf and as such receives a final verdict of EDIT: Some glitches have been ironed out, which adds + 0.5 stars to the final verdict. Due to my in dubio pro reo policy, the final verdict will be rounded up.